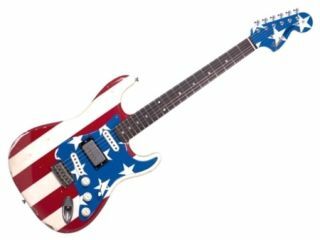 Wayne Kramer, guitarist of incendiary proto-punk group MC5, has joined the ranks of the great and good by unveiling a new signature Fender guitar - a replica of his famed stars and stripes Stratocaster. The Wayne Kramer Signature Strat will feature a S-H-S pickup configuration, with a Seymour Duncan 59 humbucker in the middle position and 'vintage-style' Stratocaster singlecoils at the bridge and neck. Also worth noting is the American Vintage hard-tail bridge, Schaller vintage-style 'F' tuners, the oversized 70s headstock and the neck plate, which is engraved with the slogan 'This Tool Kills Hate'. Keep checking the TG site for more NAMM 2011 guitar news and for more details of the Wayne Kramer Signature Strat head to the Fender site.